Francis Drake was an influential English sea captain, trader, explorer, politician, and privateer of the Elizabethan Era. He completed the second global circumnavigation from 1577 to 1580. For this he was awarded knighthood by Queen Elizabeth I in 1581. Francis Drake was the oldest of twelve children. His father was a staunch supporter of Martin Luther, and his family was forced to escape to Kent from his family home near Taverstock when the would-be explorer was only eight years old. The young Francis Drake was apprenticed to a captain trading between the Thames and the Channel ports. In 1563 Francis Drake embarked upon a voyage to the continent of Africa as part of the crew aboard the same ship as his cousin. Francis Drake and his cousin became involved in slave trading, which eventually got them in trouble with the Spanish government and authorities. 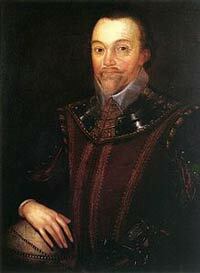 Francis Drake was awarded his first command in 1567. Francis Drake was a strong Protestant and saw himself as a crusader against the heavily Catholic Spanish empire, which he saw as corrupt. He undertook his first sailing command and raids against the Spanish in 1572. In 1577, Francis Drake undertook a series of sea-fairing, audacious raids against the Spanish and its colonies. He was fearful of his crew becoming disloyal to him and actually beheaded one of them. Then he relieved all of his officers of their duties. Francis Drake sailed along the Mexican and South American coastline, eventually arriving in California and claiming the land for Queen Elizabeth I. Sailing around the Cape of Good Hope and along the African coast, Francis Drake continued his explorations and raids, growing quite rich from his exploits. Drake eventually arrived back at a port in Plymouth, England, in 1580, being the first Englishman to sail around the world. Drake bought the Buckland Abbey estate and was elected to the House of Commons after being knighted for his service to the British Empire. Drake was not done yet. He undertook more sea raids against the Spanish beginning in 1584. As second-in-command of the British fleet in 1588, he defeated the powerful Spanish Armada in the battle of Gravelines. The mighty explorer was a hero to the British, but was considered a mere pirate and thug by the Spanish. However, they also feared the powerful British man and nicknamed him “El Draque,” or “The Dragon.” Francis Drake died of dysentery in Panama in 1596. As a tribute to Francis Drake’s exploits and achievements, a replica of one of his ships, the Golden Hind, is on display in England.